Hope everyone’s weekend was great! Mine was pretty good, despite a total lack of sleep… Teething is the worst. 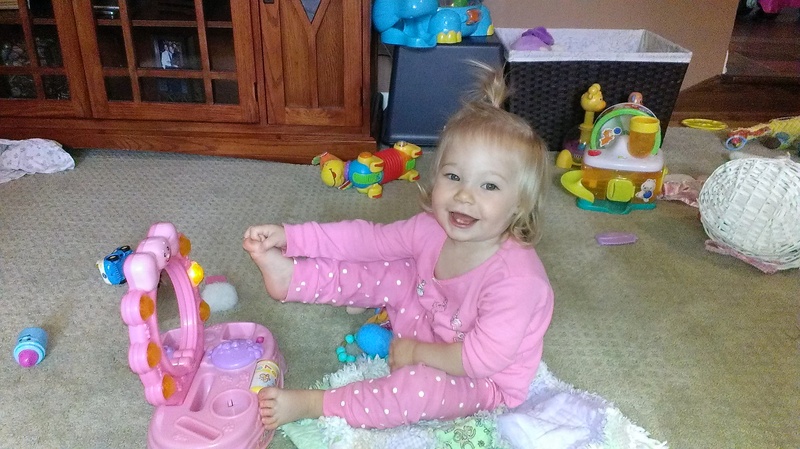 We did have a breakthrough, though (haha, no pun intended…) and Harlow got TWO teeth yesterday! 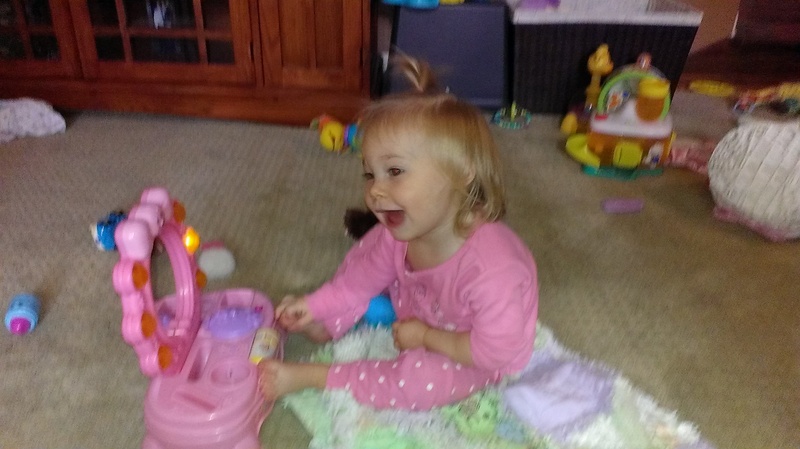 They are the last two that have been trying to come through since her 12 month checkup! 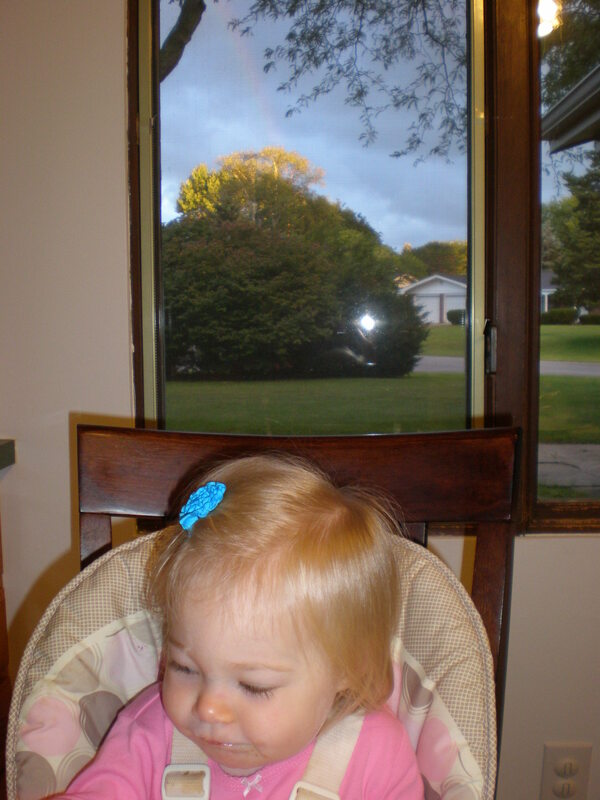 During breakfast, I noticed a rainbow out the window. It is faint, but I caught it! Literally 10 seconds later, it was gone! 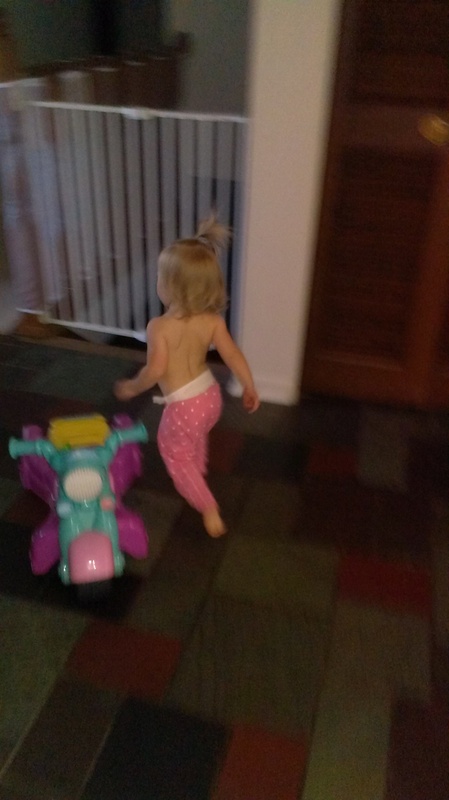 I came around the corner to find she had taken her shirt off, so I snapped this pic, and by the time I sent it to her dad (he was working) her pajama pants and diaper were pulled down exposing a full moon. That is a new thing, taking off her clothes. I’m glad it only happens at home where I can stop her (usually)! I really hope she doesn’t do it at daycare! haha. 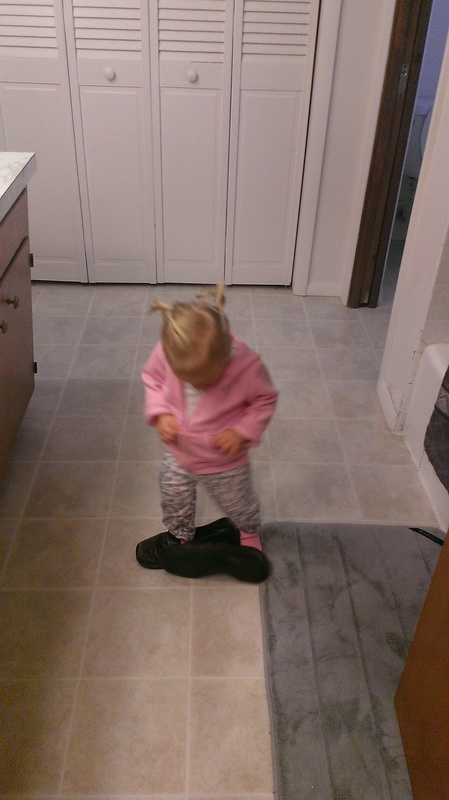 Harlow decided to try on and walk around in all my shoes… even the ones I really need to replace. 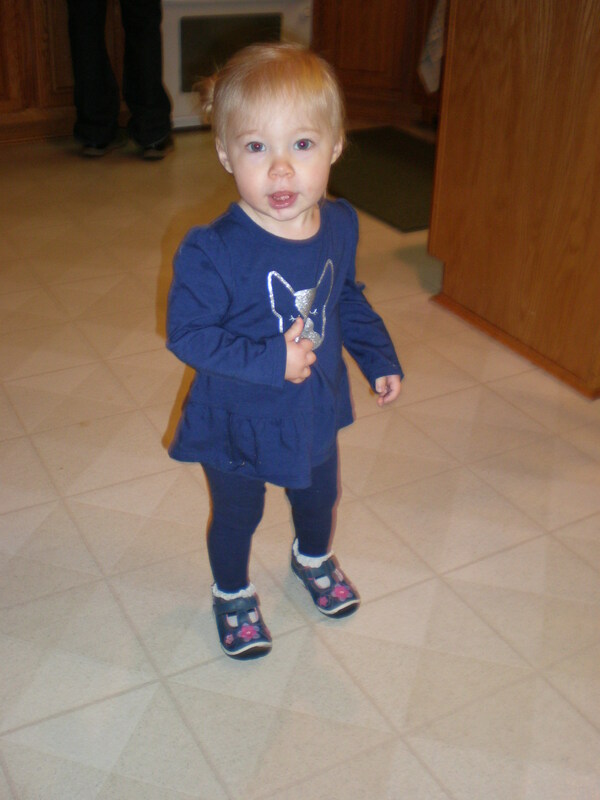 Don’t mind the blurry bathroom photo… it was the best I could get as she was walking around in my shoes. Harlow is starting to grow out of her 12 month clothes, and what she does have that fits her in 12 or 18 month sizes are summery. The weather has been very fall-like lately, plus she just didn’t have anything cute anymore, so we went shopping! I had a serious Failure As A Mother moment last week when I realized it was picture day on Friday and she had NOTHING to wear. I sent her in a pink t-shirt and flowered jeans instead of the usual frilly dress. In my defense, I had two cute dresses on order from The Gap, and they got delivered the afternoon of picture day. Which helped me…not at all. So anyway… Shopping! I love this shirt. The little dog on it is so cute! 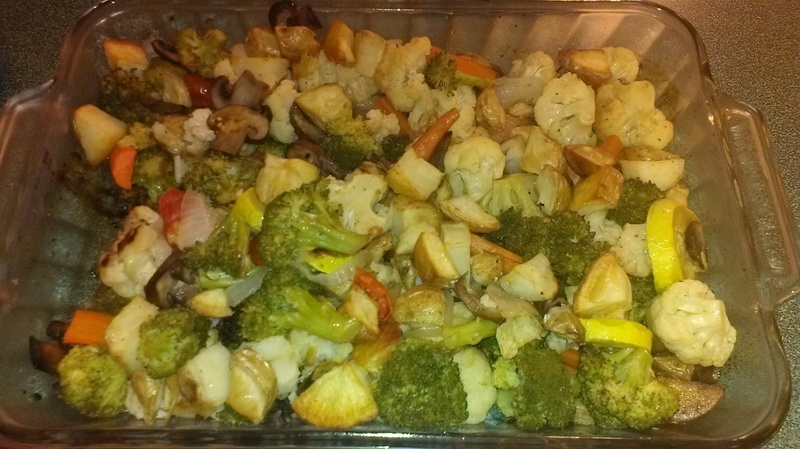 And lastly this weekend, I have been seriously craving roasted veggies lately, so last night, this happened. So, so, so good. This entry was posted in dinner, Harlow, Harlow Updates, Uncategorized, Weekend and tagged Harlow, Shopping, weekend. Bookmark the permalink.